For somewhere with that convivial atmosphere, comfort and the sense of well-being, there is the La Veranda Room, a banqueting hall for up to 100 people. The festive events of the elegant and refined reception room. ( cateringfor banquets and ceremonies for up to 200 people). What could be better location for a celebration or holiday than the beautiful setting of the hotel’s La Veranda restaurant. Our staff not only add professionalism and experience when organising these events, but do it with a warm and friendly manor. Whether it’s a dinner or a buffet for that important occasion (baptism, communion, confirmation, weddings, graduations and parties), the restaurant will help to create a menu according to your desires and will give advice with menu selection and mise en place (place settings) according to tastes and desires. We guarantee an organised and impeccable service. What could be more exciting than a magical winter wedding? The hotel’srestaurant offers you an opportunity to celebrate in an original way on the most unforgettable day of your life. We provide two rooms for that loving and romantic ceremony. This room is ideal for a reception buffet. 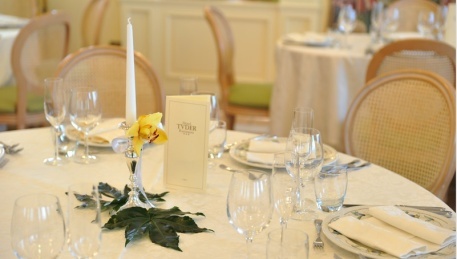 The room has a warm and friendly atmosphere suitable for your wedding breakfast. Our chef will prepare for you a special menu that will delight your guests with style and elegance,incorporating refined and tasty flavours of the season. Contact us to find out the details and offers reserved for weddings in winter.